cars half a century ago ! To the casual observers, visitors and passerbys, what took place in July 2001 on the streets of Franklin TN and on the back roads around this historical town just south of Nashville might have seem almost ordinary... just a lot of "old" cars being driven around and a few hundred people having a good time... 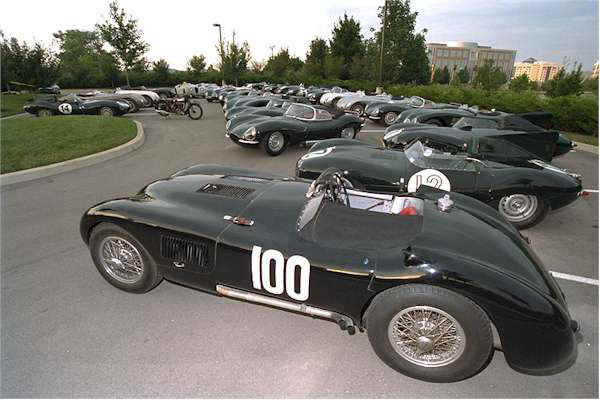 However, to any Jaguar enthusiast, the 2001 JCNA Challenge Championship will be remembered for a very long time not just for the 200 Jaguars entered but as a unique opportunity to admire the largest group of historic and unique C and D types ever assembled. ...when race car drivers were gentlemen and their race cars largely based on their road going cousins, one little town in western France was the site of a race most manufacturers wanted to win : the 24 hours of Le Mans. To anyone interested in motor racing, the name represents one of the most famous endurance race track in the history of racing, the site of spectacular accomplishments, breakthroughs, tragedies and even near miracles. Held on the 8.5 miles Circuit de la Sarthe (near the western France town of Le Mans), a track mostly made of public road, the Le Mans 24 hours race is one of longest running event in motor racing and has attracted manufacturers from all over the world. It still does today. Since 1923, the 24 Hours of Le Mans has often been dominated by one manufacturer for a few years in a row. Bentley, Alfa Romeo, Ferrari, Ford, Porsche have all left their mark on the event but in the 1950s, it was Jaguar which dominated the prestigious race, in a way that was unheard of at the time. It all started when Jaguar launched its new XK engine in 1949 in a new hastily designed sports car which was only supposed to be a showcase for the engine while the company's new saloon was being designed. Jaguar was only expecting to build a few hundred cars but the performance and the price of the new XK120 was such that the company had to change its plans and build special tooling to keep up with demand; 160 hp and 120mph top speed was unmatched at the time for a production car. In 1950, three factory prepared XK120s were taken to Le Mans and entered in the 24 hours endurance race to see how they would fare against the competition. While they didn't win or even scored a top three finish, valuable lessons were learned and the potential of Jaguar's all new sports car was confirmed. Around the same time, various successes in sports car races such as the Silverstone Production Sports car race or Ulster's Dundrod Tourist Trophy ( one of Stirling Moss most important win) convinced Jaguar to build a special race version the XK 120. Motor racing was seen as a way to build the Jaguar name and reputation. With a more aerodynamic body designed by recently hired aerodynamicist Malcom Sayer, the XK120C better known as the C-type was lighter and also more powerful than the production XK120 as its engine received larger exhaust valves, modified cams and larger diameter carburetors. The first three C-types were ready just in time for the 1951 Le Mans race and largely untested when the team, led by Stirling Moss, arrived at Le Mans. Competition was fierce at Le Mans in 1951 and the Jaguars were not the favorites; Ferrari with no less than 9 entries including four V12 powered 340 America was seen as the top contender along with Briggs Cunnighams cars, powered by the all new Chrysler 5.4 liter hemi V8. 1951 was also the first time at Le Mans for a small company who would later become a major player in the sports car world, Porsche, with a single 356 entry. who broke the speed record down Mulsanne at 172.97 mph ! At the end of the first lap, Jaguar confirmed their potential with strong showings in the top 10 including Moss in second position. By lap four, Stirling Moss had taken the lead and after 2 hours had a full lap on his competition. During the night a broken oil pipe first on Biondetti's car and then on Stirling Moss' while leading forced both cars to retire. The third car however, driven by Peter Walker and Peter Whitehead went on leading the race and broke the event distance record after 23 of the 24 hours, despite the rain. One hour later, after 24 hours of a grueling race, Jaguar took the checkered flag at Le Mans for the first time in its history. In the process, the C Type set 3 new records in addition to coming in 77 miles ahead of the 2nd place car : fastest lap speed at 105.232, new 24 hour record of 93.495 and greatest distance covered with 2 243.88 miles. Following that first win, and in anticipation of increased competition from Ferrari and Mercedes in 1952, a more streamlined version of the C-type was sent to Le Mans. Unfortunately, the modifications were done at the last minute and mostly untested resulting in overheating problems on all three entries which would drop out of the race. 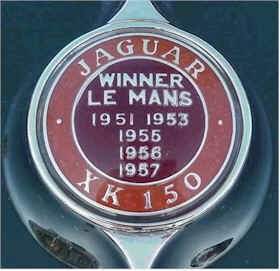 Jaguar returned to Le Mans in 1953 facing what was probably the fiercest competition assembled at Le Mans with all major manufacturers and top drivers assembled. 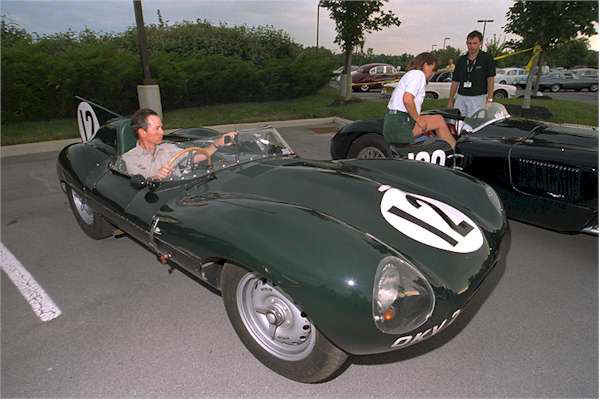 The 1953 C-type was significantly modified from the earlier model and was 120 lbs lighter. It featured a more powerful version of the XK engine equipped with Weber carburetors instead of SUs, aircraft styled fuel tank, and a redesigned rear suspension. Most importantly, for the first time it was equipped with revolutionary disc brakes which allowed the drivers to brake later into the corners and not to suffer from brake fade, very important at the end of the 150 mph 3 1/2 mile Mulsanne straight. This helped the C-Type to sweep the event partly despite the fierce competition. As the C-type was establishing the Coventry marque as one of the top contenders, development was underway on its successor, the D-type which would be developed from the ground up as a race car, unlike the C-type. The first major innovation of the Bill Heynes and Malcom Sayer design, would be the central monocoque section, built using magnesium alloy, with tubular front and rear subframes. The engine was an upgraded version of the XK engine used in the C-type developing a little more power to propel the car at over 170 mph. By the time the XK150 came out, there was little room left on boot badge to display the victories ! In 1954, the debut of the D-Type was less successful than the C-type with Jaguar unable to capture a second straight victory, having to settle for second place but only 1 minute 45 seconds behind the wining 4.5 liter Ferrari. Fuel contamination early in the race delayed the D-type which came back into contention once the problem was solved but couldn't clinch the victory. 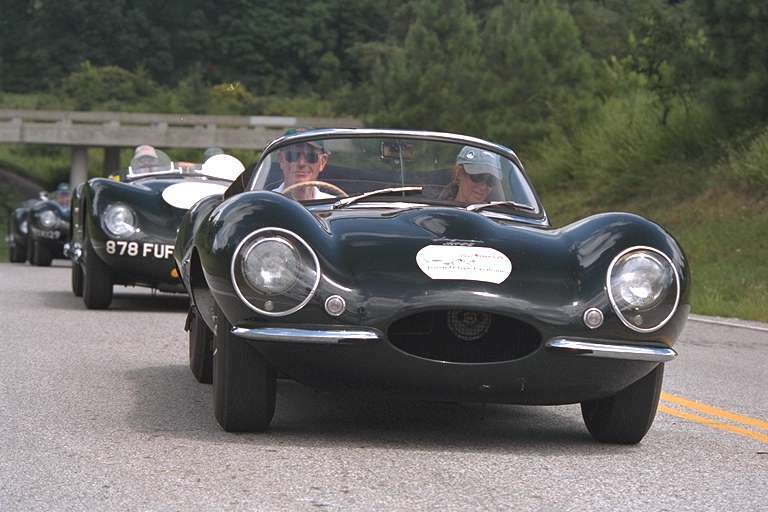 A C-type came in fourth place rounding up honorable results for Jaguar. The D-type first Le Mans victory would come the next year in 1955, with a slightly modified car including a 7" longer bonnet, hence the name long nose D-type, tonneau cover above the passenger space, a fin behind the driver's head and higher windscreen. Under the bonnet, the XK engine received new heads with larger valver, boosting hp to 275. Sadly there would be little to celebrate for Jaguar as the 1955 race will remain in motor racing history as the site of the most deadly accident, with 80 spectators killed when a Mercedes 300SL driven by Pierre Levegh hit an Austin Healey stopped in the pits and launched into the crowd. Safety was not a priority at the time, most tracks didn't have pit walls separating the pit lane from the track itself and there was no fence or protection for the crowd. Later in the race, the Mercedes team withdrew its remaining cars cutting short a thrilling battle between Jaguar's new driver Mike Hawthorne and Mercedes' Manuel Fangio. 1956 would be the year of another D-type win, although by the Ecurie Ecosse private team following an early collision between 2 of the factory cars and the retirement of the third later in the race. This would be the last year that Jaguar would enter Le Mans with factory cars as they announced their withdrawal from racing in 1957. Despite this, privately entered D-types led by Ecurie Ecosse would be extremely successful in the 1957 edition crushing the competition with all 5 D-types entered not only finishing but taking 1, 2, 3, 4 and 6th place. Of course even in 50s things moved very fast in the world of motor racing and in 1956, when the D-Type started showing it age Jaguar went on to produce a street legal supercar: the XKSS. Essentially a street conversion of the last D-types to roll off the line at a time were sales to race team slowed down, the XKSS is a very special car in Jaguar's history because of very low production numbers : only 16 were built before the Coventry factory was destroyed by a devastating fire causing the loss of the tooling needed for further production. Modifications to the racing D-type included a muffler, convertible top, turn signals, a luggage rack and a slightly less spartan interior. 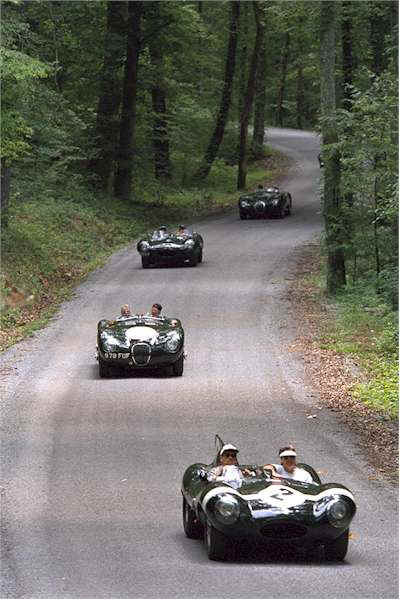 To most, the XKSS is the ultimate road going classic Jaguar ever built... Three of them could be seen in Franklin. While Jaguar was making its mark on Le Mans and road racing in Europe, many C-types and D-types were exported to the US where they were raced with great success. This was equally critical for Jaguar since America was its largest market, and is still today. In fact some 42% of the C-types built came across the pond, along with a similar proportion of D-types, where they entered and dominated road racing both on the East Coast and the West Coast. Jaguar North America used the Le Mans victory and the marque's accomplishements in Europe with printed materials and brochures but the successes of the Cs and Ds on American tracks also did a lot establish the Jaguars as the very best sports cars available in America. From private teams racing Jaguars on race tracks around the world to what was learned and later used in the E-type, the C-types and D-types are truly the foundation of the Jaguar heritage we are all so proud of today. Times have changed... race cars drivers are now stars and often businessmen, their cars usually have nothing in common with the production models, cocooned in expensive trailers... imagine this year entries being driven from their factories to the Le Mans before the race just like the Cs and Ds were in the 50s ... Times have changed and it's also why Jaguar heritage is so unique and cannot be allowed to disappear. When details started to come out on the 2001 Challenge Championship, heritage was one of the key word and not just because of the location chosen but because 2001 happened to be an important anniversary year for Jaguar enthusiasts : 100th anniversary of the birth of Sir Lyons, 70th anniversary of SS Cars, 50th anniversary of the first Le Mans victory, 50th anniversary of the XK120 FHC, 40th anniversary of the E-type and 30th anniversary of the V12... that is a lot to celebrate. 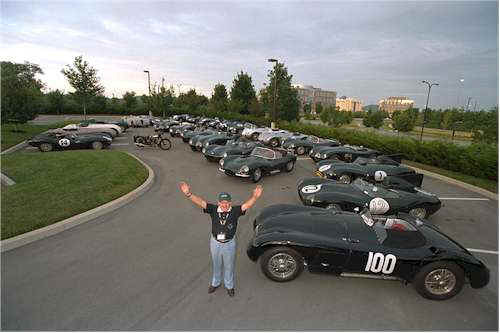 Many Jaguar enthusiasts knew Franklin would be the place to be in July 2001 but we just couldn't imagine how special it would be, despite rumors that a good number of C and D Types would be there, until the cars actually started coming in and filling up their special parking section at the Marriott. In addition to event chair Kathy Nell and her husband Jerry, one person is largely responsible for this incredible reunion. Terry Larson, a well know collector and Jaguar enthusiast from Arizona, was asked by Kathy Nell to put together a group of C and D Types for the JCC. A special project, time consuming but made a little easier by the fact that Terry knew many of the owners personally as he organizes a special annual tour for these cars in Arizona and also maintains the C and D Type register. 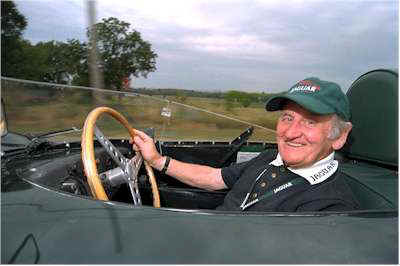 Norman Dewis driving the OKV2 D-type, a car he not only developed but raced himself placing 5th at Goodwood in 1955. He drove it again in 2000 at Monterey ! Of course, heritage is not only about machines but also about the people responsible for their creation and development. Even though almost half a century has passed since the first C-Type took to the track, Norman Dewis the man behind the testing and development of the C and D-types is still with us and extremely active in keeping the Jaguar heritage alive. As Chief Proving Engineer, Norman Dewis was directly involved in the development of every Jaguar, production or prototype, built since he joined Jaguar in 1951 all the way until the XJS and XJ40 programs. He had not only driven most of the Cs and Ds brought to Franklin but also raced some of them himself as driver and even as co driver to Stirling Moss in the 1952 Mille Miglia, in a real world test of the new Dunlop disk brake system. Now 81 years young, Norman Dewis doesn't let his age get in the way of his passion for Jaguars and often attends Jaguar events in Europe as well as in the US. His incredible energy can be felt when he talks about these cars and even more when the gets behind the wheel of one, especially on track like at the Goodwood festival or the Monterey Historic races where he will once again drive the OKV2 D-type this summer, in August 2002. Incidently, Norman holds the speed record for a D-type at LE Mans, with a run down the Mulsnane Straight at 192 mph.... in 1955 ! His remarks during the award dinner were filled with annecdotes and inspiring reminders on his career and Jaguar : from the extensive testing of the XK120, the famous world record run on the Dutch highway at Jabekke under an aircraft style buble canopy, the cross country drive of the E-type prototype just in time for the Geneva unveiling, and of course to his XJ13 high speed crash while shooting footage for the launch of the V12 E-type in 1971. Every other year, JCNA pulls its resources and teams of volunteers together to organize of top quality North American gathering where some of the best classic Jaguars can be admired. For 2001 thanks to the efforts of people like Terry Larson and the passion of all the other collectors who brought or sent their Cs and Ds to Franklin, the Championship Challenge was a unique opportunity to see the largest group of the rarest Jaguars ever built. - To view all 82 pictures in the gallery, use the Next Previous First and Last links, descriptions when available will appear under the picture. Once you've clicked on Next for the first time, you can just press Enter to activate that link again. The drop down box allows you to jump to a specific section. - You can select a smaller image size by clicking on the small Med and Large link. Default size upon loading is medium, if your screen is large enough please switch to Large for best quality. - Note that images are preloaded when you first loaded the page so there should not be any delays when viewing the gallery or switching sizes. These problems appear to be solved in Netscape 6.x .